The warm-up shots arrive one after another, but Danny Tamburlin is up to the task. He kicks out his left foot to make one stop, shoots out his left arm to make another. "Great save," shouts volunteer Mark Spacone. "That one was going upper corner where mama hides the cookies." In many ways this could be any soccer field on any summer night in Western New York, with children making their way up and down a pitch lined with parents urging them on. But there is one inescapable difference. You see, Danny's in a wheelchair. Some of his teammates maneuver with walkers. Others chug along with the help of leg braces. All the children in attendance are disabled to varying degrees, autism, Down syndrome and visual impairment among the afflictions. What they all have in common, what really makes them a team, is a depth of spirit that's off the charts. 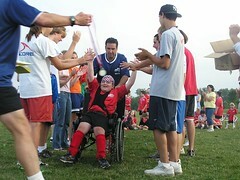 "At first Danny thought he couldn't do this because he's in a wheelchair," said his mom, Chris. "He was amazed that they would be adaptable to him. And he loves playing goalie." The program's called TOPSoccer and its growth has been rampant since Teresa Doermer planted the local seeds in 2001. Doermer's a soccer mom schooled in special education and serves as director for the Olmsted Center for the Visually Impaired. When she found out TOPSoccer lacked a Western New York presence she put an end to that, enlisting the help of New York State West Youth Soccer to form an area chapter. The first year, nine children showed up. This summer, 61 kids ages 5-19 are registered for the six-week session held Tuesday nights at the West Seneca Soccer Complex. Alumni number 120. There is also a six-week indoor session over the winter at the Sahlen's Sports Park in Elma. At least it usually lasts six weeks. One year, a family, thrilled with the program, offered to pay the standard rental fee to secure a five-week extension. Joe Sahlen wouldn't hear of it. You want another five weeks you get it at the same rate: free. That's the thing about programs like TOPSoccer. Doubtless the children derive immense joy out of participating. The camaraderie is evident. Many wear their uniforms to school in a proud display of affiliation. "I like it when my friends are out there playing and I get to help them," Danny said. "I like the helpers, too." And then he leans a little closer and quips, "I had to mention that," melting the hearts of those within earshot. Truth is, though, the adults might get more out of it than the kids. When Scot Boniface was recruited to assist he said he'd be there when he could. Now Boniface, a soccer referee, runs the show on the field, draws up a lesson plan for every week, couldn't even contemplate walking away. "It's a feel-good program for everybody," he said. Jim Hanlon's the same way. He came out at the suggestion of a mother of an autistic child, figured he'd fit the weeks in as he could. Now he's not missing a session for anything. "You know this is going to be the best hour you have all week," he said. Doermer put it in motion, acquiring equipment with a grant from the Ronald McDonald House, minding all the details. There are oversized balls for kids in wheelchairs, fluorescent balls with bells inside for the visually impaired. "When we give them their uniforms, that's the best," she said. "Now they're part of a team. They have uniforms and they're playing soccer, just like their sisters and brothers do." The payback comes by the second. With every gleeful shout. With every high-five. With the woman who felt obliged to say, "Thank you. I never thought I'd be a soccer mom."